But that’s all the good news there is. While China managed to slightly cut its emissions of anthropogenic CO2 between 2013 and 2016, the country remains the world’s largest producer of carbon emissions, with the trend not reversing anytime soon. The Asian giant is still building coal-fired power plants in large numbers as the country’s economic growth is powering along at a very high rate and is demanding ever more energy. Unfortunately, most of that energy comes from CO2-producing fossil fuels, which account for 86.4% of China’s primary energy consumption. Demand for oil is skyrocketing, due to a rapidly expanding automobile market. What’s more, electric car usage is not growing fast enough to overcome this challenge. Hydroelectricity has hit a plateau due to a lack of suitable sites, as has also been seen in Europe. The contributions from wind, solar and nuclear power are still very low, despite a rapid increase. Even if renewables were to grow at a quicker pace – which currently seems unlikely – it is doubtful they will make a significant contribution for another 20 years. In the meantime, electricity demand expands at 6-7% a year, driving an absolute increase in fossil fuels and dwarfing the reductions possible from low-carbon electricity sources. One of the biggest remedial steps Beijing could take is to make good on its promise to clean up China’s highly polluting industrial ecosystem. Particularly the energy-intensive aluminium and steel industries, which have been operating at immense overcapacities for years and consequently are keeping power demand artificially high, are responsible for a large portion of pollution and carbon emissions. Yet in contrast to its initial promises, China recently took a step backwards when it decided to soften the winter cuts originally mandated from heavy industry. Despite plans to reduce heavy industry production by up to 50%, the Ministry of Environment and Ecology recently granted local governments more leeway in deciding on how much production should be cut depending on the “individual situation” on the ground. 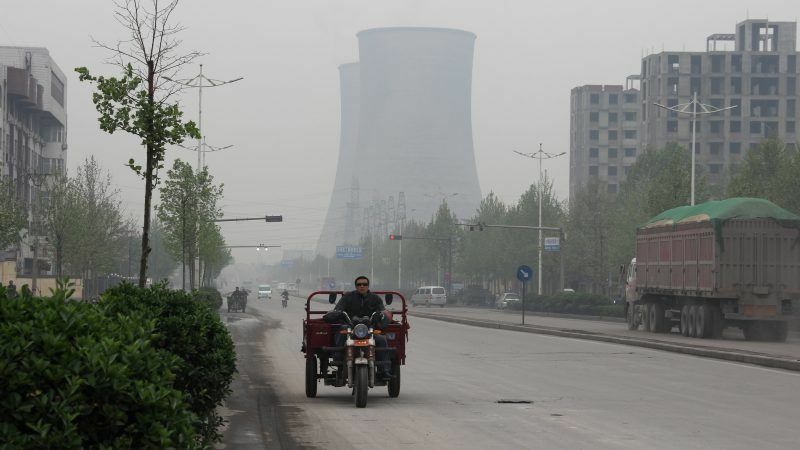 The move was surprising considering that a probe launched by the Ministry itself in October revealed that regional governments had circumvented the implementation of Beijing-mandated anti-pollution efforts. Instead, the probe found the provinces of Henan, Yunnan, Guangxi and Guangdong had merely taken ‘“superficial”, “fake” or “perfunctory” rectifications’ to comply with environmental regulations. In these efforts, foreign capital – including European investment – could be a pivotal factor. Currently, access to certain green sectors is curtailed by Beijing and domestic producers hold an unfair advantage over foreign competition due to generous amounts of state aid they receive. It’s no wonder that Western companies market share has been decreasing across the board in green sectors. But the government’s bid to protect national companies comes at a cost: it blocks access to cutting edge technology. Therefore, convincing China to allow more access for foreign investors in the country’s green economy would be a good first step. The EU already maintains a bilateral dialogue with China on tracking the implementation of the Paris Agreement, which was sealed at the 2015 UN Climate Change Conference (also known as ‘COP21’). The upcoming COP24 in Katowice should be key to the EU’s collective approach to exerting more pressure on the country through a mix of carrots and sticks. Still, while Europe can help China and others in finding low-carbon solutions to fuel entire economies, it must realise that it has a lot to do itself. The EU is as much a part of the climate change problem as China, with per capita emissions in many European countries being problematic if current climate goals are to be achieved. The EU’s engagement with Beijing will be more credible – and likely more successful – if member states takes their own advice first. Understanding what should happen and how this should happen is going to take time. The decline of the planet will effect economies if no-one takes the lead and can showcase a workable path forward towards zero-emissions. Europe has not done this yet, despite the many claims to the contrary. We need to decarbonise natural gas, cheaply. For this to happen, investments in reforming technology are needed. I can imagine a roadblock set up to thermal pyrolysis; because if this proved cost effective it would be mandated throughout the EU and elsewhere. However, I am confident that this or similar methane reforming technologies are going to be implemented at scale, and this can be witnessed by the recent UK BEIS statement; building on many years of planning already, which shows that starting in the 2020s, industrial sites will start using decarbonised gas (gov .uk/government/news/plan-to-enable-first-uk-carbon-capture-project-from-the-mid-2020s-announced-at-world-first-summit). It is impossible to decarbonise before 2050 without CCS, because extremely large capacities of offshore wind or solar PV would need to be installed; something like double the total overall electricity capacity; and thats before we reach 100% renewable electricity. CCS is a necessity; there are no other ways to achieve the quantities of decarbonised gas required within the Paris Agreement timeline. So before the EU starts lecturing; I think it may be important to devise a plan where we can use some of the funds gathered by carbon pricing, to invest in the methane reforming plants required. The EU has billions gathered from the sale of emissions allowances, and these can be distributed in the form of subsidies for CCS facilities given to factories etc. Legislation will have to be drawn up to ensure no company suffers a competitive disadvantage during the change-over period. The system then allows these companies to accept hydrogen from a number of sources, such as electrolysers run by nuclear or renewables, or carbon-negative (in effect) biomethane. This is the only path to decarbonisation, because we do not have a supply of energy that can easily replace fossil gas that can be implemented to the scale required within 30 years. So CCS is absolutely key, and needs legislation – this is the only real barrier. The costs of inaction severely outweigh the cost of action – and this means CCS.